Our product range includes a wide range of electric winch machine. Rope Drum Steel fabricated Drum duly machined, with flanges at both ends. 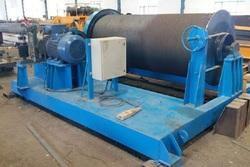 Winding Capacity 100 Mtr. of Wire Rope. Drums with larger winding capacity can also available. We emerged as the leading manufacturer of¿¿Electric Winch Machine. Electric Winch Machine are designed as per IS-9507-1979 and are suitable for heavy Duty applications. Generally, Winches with Right Hand Operation are manufactured, however , the same can supplied with other side operation also as per requirement. 2 modals are available for portable electric power winch machine. High Starting Torque, Class 'B' Insulation,150 Starts/ Hr415V, 50Hz,3 Phase, A.C. Induction, squirrel Cage/Slipring motors conforming to IS-325 of reputed make like NGEF/CROMPTON/BBL/BHT etc.